This was a gorgeous, gooey delicious mess :-) I got the idea from the 2008 Canadian Living magazine Christmas edition that my mom sends me every year. 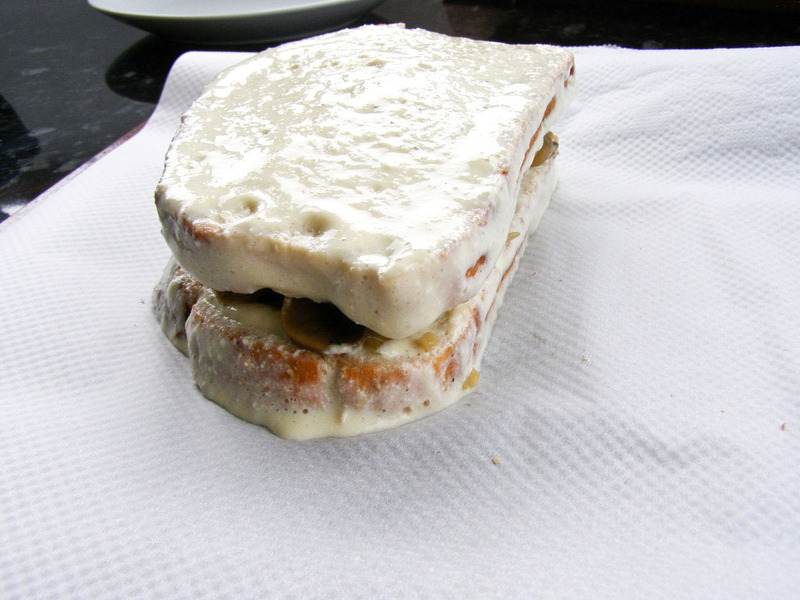 I already have a good recipe for sweet french toast so just based my vegan version on that. 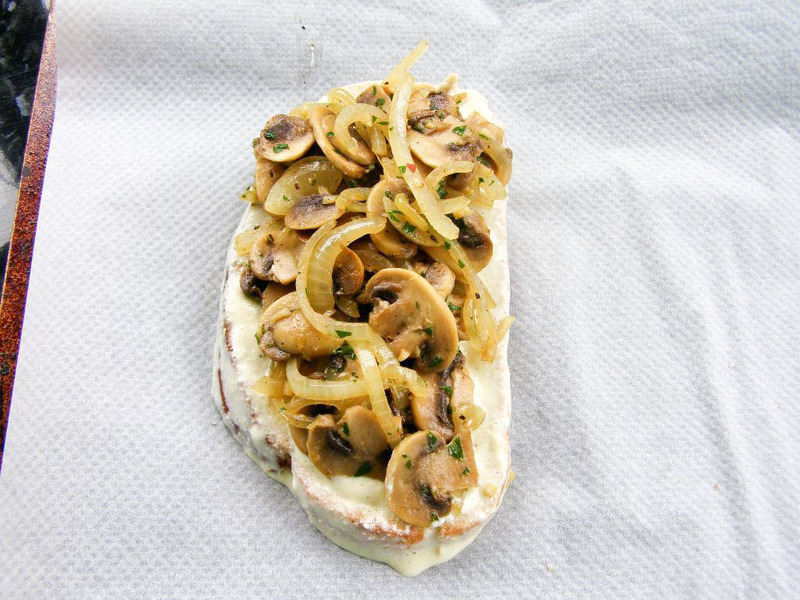 Put a pat of margarine into a frying pan, melt and add the onion, garlic, mushrooms, lemon thyme and salt and pepper. 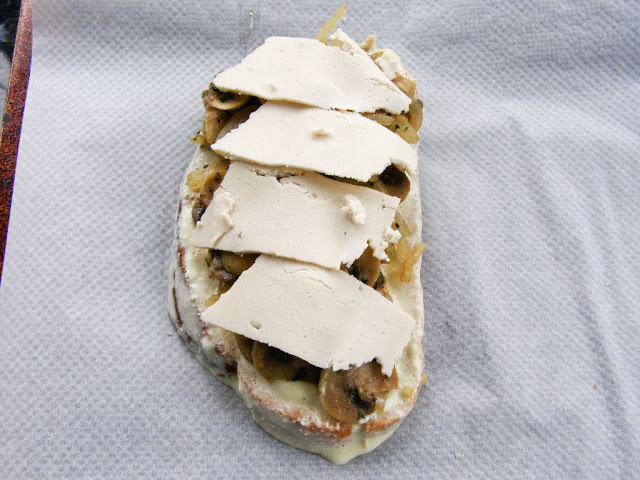 Fry until onions and mushrooms are soft and any water is evaporated. Set aside. 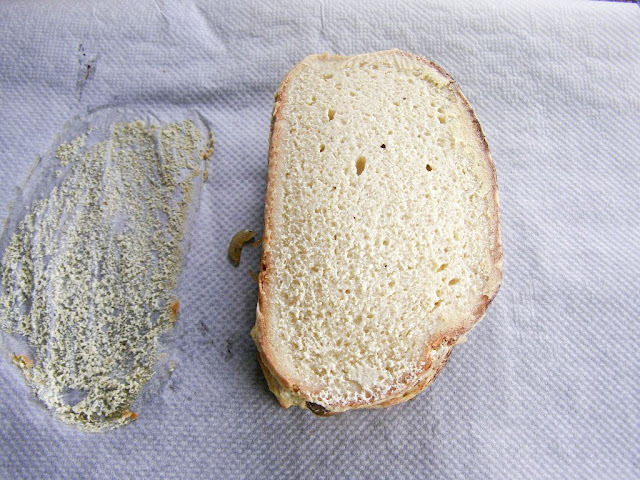 Preheat oven to 190C and line a baking sheet with baking paper. 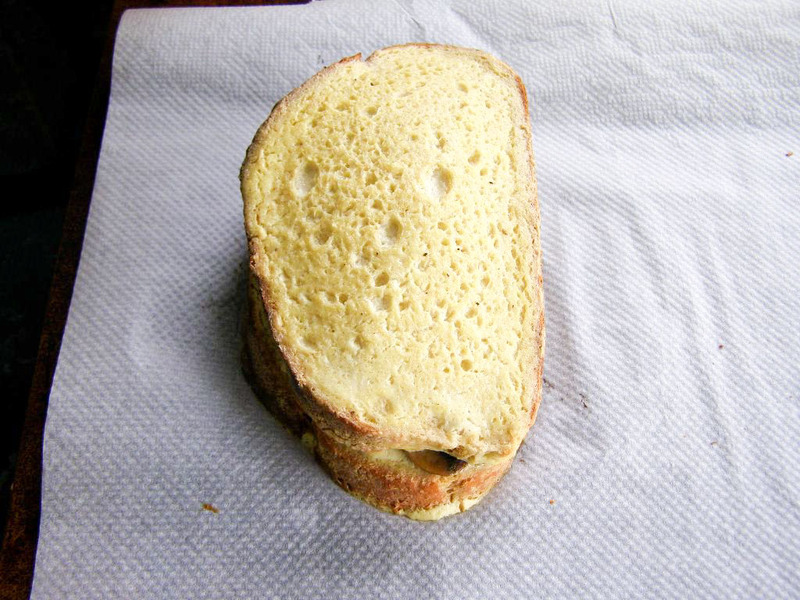 Cut 2 slices of large french bread (preferably a day or two old). 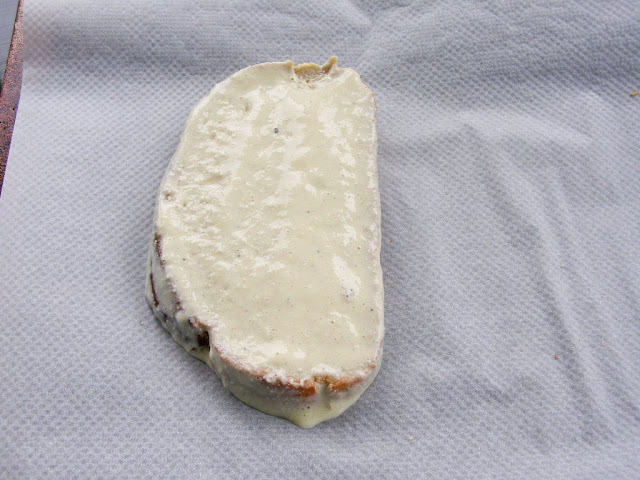 Dip a slice into the batter and place on the baking sheet. Top with the mushroom filling, a slice or two of cheezly then dip another slice of bread and place on top. Bake, turning once until crisp and golden brown on top 20 - 25 minutes. 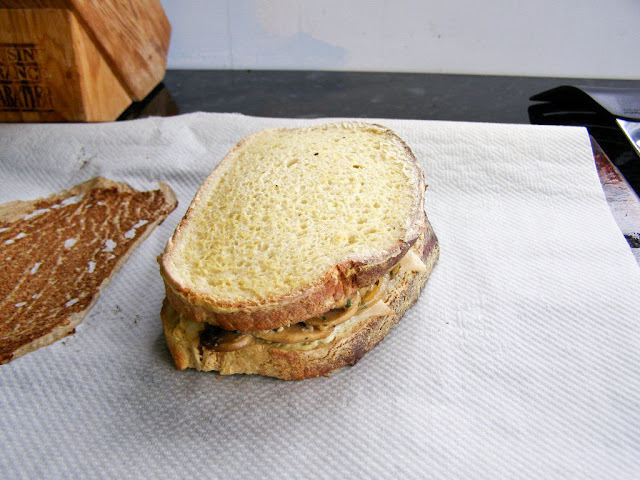 I found it never got really golden and gave the baked sandwich a quick fry in a greased frying pan, that gives it a nice golden and crispy top and bottom. As I have the basic tofu mixture in the fridge, I hope to blog the basic french toast soon as well. Edit - here it is! 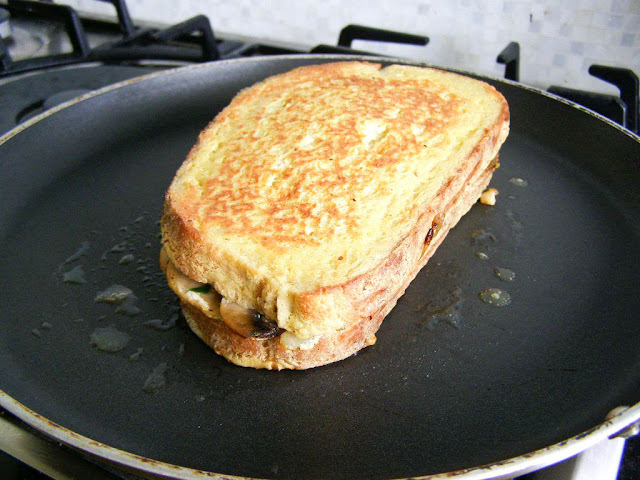 2012 Edit - Cheezy Mushroom Filled Dijon French Toast Sandwich! So, it's now June, 2012 and I just made this again - why on earth did it take me so long to make it again??? This is so amazingly delicious, glad I came back to it and got a reminder just how good it is :-) I made a few changes this time though, not that the last one wasn't as good, it is, I just felt like adding dijon to this, it goes so well with mushrooms and I am slightly addicted to it! I've also managed to make this easier in the sense that I no longer have to blend such a large quantity of the dipping mixture as I've discovered you don't need a blender at all - just whisk it up really well. That way you can make up the dip for just one sandwich and anything that does not involve hauling out major equipment is going to be easier! I also got step by step photos so I'll add them here. 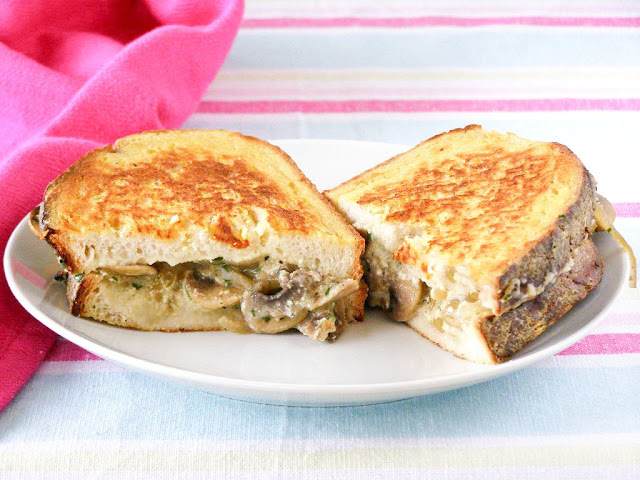 Cheezy Mushroom Filled Dijon French Toast Sandwich - makes 1 sandwich. 2 slices good quality white bakery bread, preferably sourdough. A few slices of vegan cheeze, I used mozza cheezly this time but probably prefer the cheddar style in this. First make up the dipping mixture by simply whisking everything together really well, get it as smooth as you can. If you have a hand held blender that would be ideal but this is too small an amount to blend in a full size blender. Now make the filling by adding the vegan butter to a hot wok then adding the mushrooms, onions and garlic. Give it a good stir then add the salt and pepper, reduce the heat and fry until soft and there is no more liquid. Stir in the parsley then transfer to a bowl and set aside. 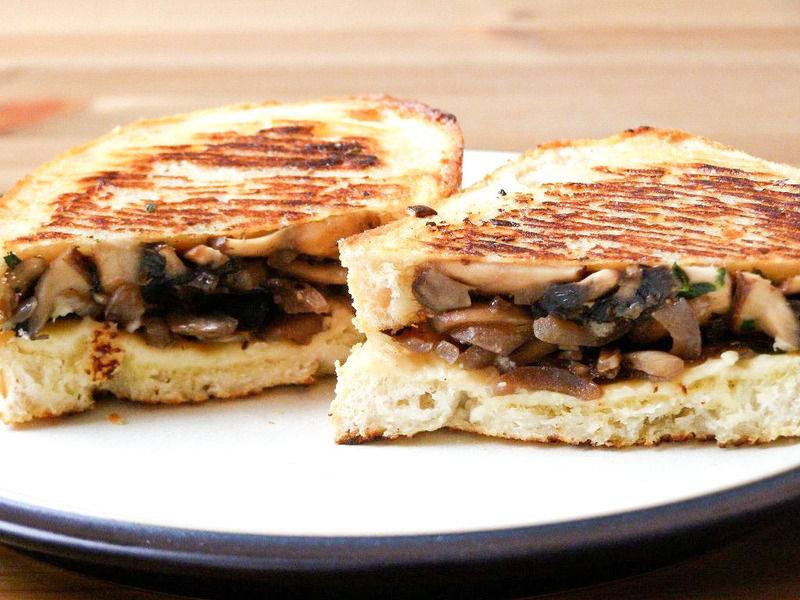 Now, heat up a little more vegan butter in a non-stick frying pan and add the sandwich, fry until crispy and golden on one side then flip and fry the other side. Now, simply slice in half with a serrated knife, wait a couple minutes if you can to eat as it will be lethally hot, then enjoy!